Have you ever thought about why it is that we get sick or why we encounter negative emotions? 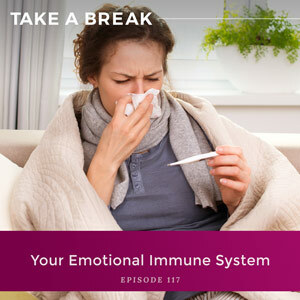 A recent bout of illness led me to start asking those questions and connecting the dots between the necessity of getting sick to build up our physical immune system and experiencing negative emotion to fortify our emotional immune system. When we avoid pain at all costs, when we try our best to keep ourselves out of situations that could cause us negative feelings, we aren’t challenging our emotional immune system to build the skills necessary to deal with all of those circumstances. Join me today to learn how using alcohol to numb feelings perpetuates the cycle of avoidance and sickness of your emotional immune system. Harm itself is not the problem here; the thoughts you have, the emotional distress that you experience when you are unable to tolerate how you feel, is what’s harmful. What our emotional immune systems do. What the emotional immune system views as harmful. How thinking about how something could potentially hurt you doesn’t challenge your emotional immune system in a beneficial way. Why seeking a “clean” emotional life is actually harmful. Why harm does not equal negative emotions. How to build a strong emotional immune system. 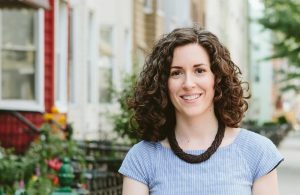 You are listening to the Take A Break podcast with Rachel Hart, episode 117. Well hello everyone. You know, I have been thinking about my immune system a lot the past almost six weeks because I have been sick for that long. And it’s not just me. My baby has been sick, my husband has been sick. We have all been sick and I cannot remember the last time that I have been sick for such a long period. It started with a cold back in February that turned into bronchiolitis for the baby and then just followed by sneezing and coughing. I have been sounding terrible. I actually lost my voice twice over this period. And then last week my baby got a stomach virus for the first time. I will really spare you the details, but it was not fun. And then a couple days later, I started seeing spots on his face and his legs and I took him to the doctor, and it turns out he caught something called hand, foot, and mouth disease, which if you have never heard of that before, I had never heard of it before. It sounded like a bovine disease but this is not to be confused with hoof and mouth, which is what cows and goats and sheep get. Hand, foot, and mouth is something that humans get. And so my baby came down with it and then guess who came down with her own infection of hand, food, and mouth? Me. I did. It basically felt like I had strep for a couple of days and I had a really, really high fever. And I’ll tell you that over this period, being sick for this long, I have watched myself slip into several pity parties for myself, but not just for me. I’ve noticed my brain thinking a lot about how I wish that my baby was better. And every time something would happen and he would get something new or spike a fever or start throwing up or I’d listen to that rattly cough that he still has, I would just think, “Oh, the poor thing, he’s just a baby. I wish he wasn’t sick,” and I would find my brain thinking this over and over. And it occurred to me that if I would wave a magic wand, my brain would choose for him never to be sick. I would want him to always be healthy. And I was thinking about this a lot and I started thinking about is that actually a good thing? Are there benefits of getting sick? And maybe actually, I have it totally backwards because of course, getting sick is how you build a robust immune system. Getting sick is what teaches your body how to handle invaders, and never getting sick, that would actually make him weak. Instead of building this robust immune system that is practiced at handling invaders, if my baby never got sick, he would have a very fragile immune system and that fragile immune system would actually make him more unsafe in the world, which the more I thought about it, the more I thought god, this is amazing. I’ve never really thought about it in these terms. Your immune system, it’s your body’s defense against infectious organisms and other invaders. Things like bacteria and viruses and fungi. But listen, not all of these things are bad. In fact, the more that scientists study the microbiome and that’s just a community of bacteria and viruses and fungi that live in our bodies, the more scientists are realizing how important they are for our survival. And it’s funny because I will tell you, it doesn’t seem like it was that long ago when all bacteria was bad, all viruses were bad. Everything was antibacterial, everything was about hand sanitizer. And we went through that period and people are like, oh wait, maybe that’s not such a good idea. Because it turns out that you can’t paint bacteria with one broad brush. Yes, some of them cause problems for our body but some of them are also vital for human health. And you know what, it’s not just bacteria. Researchers investigating how the body works are discovering that viruses also, which are part of our microbiome, they may in ways that we don’t yet understand promote health as well. So your body’s immune system is how the body manages the flow of pathogens to help you avoid harm, and that harm is sickness or disease, and avoiding that harm helps you thrive in the world. Now remember, if you listen to the podcast, you hear me talk about this all the time. Humans evolved in a dangerous world. That’s why the brain evolved to find pleasure, avoid pain, and do so as efficiently as possible. But here’s the thing; it’s not just our brain that evolved in a dangerous world. Your immune system also evolved in a dangerous world. For most of human existence, the environment was characterized by extreme challenges. There are foodborne illness, there are unclean water, there were unsanitary conditions and they were everywhere. All of these things could create sickness and disease. So the brain was worried about finding pleasure and avoiding pain but the immune system was worried about pathogens. It’s that center of defense to keep your body healthy. So listen, what does this all have to do with drinking? Thinking about my immune system and thinking about being sick and the benefits of being sick got me thinking, you know, I don’t think we have just a physical immune system. it’s not just an immune system that’s helping with the flow of managing pathogens. We also have an emotional immune system. And that emotional immune system is how your mind manages the flow of feelings, positive and negative emotions so that you can thrive in the world and avoid harm. And having a fragile emotional immune system is just as problematic as having a fragile physical immune system. When either your emotional immune system or your physical immune system are fragile, you will be more unsafe. So you hear me talk about this. The habit of drinking is how we learn unconsciously to cope with negative emotions, by pouring a drink, and that habit weakens your emotional immune system. It weakens your ability to manage your own flow of positive and negative emotions. So I want to talk to you about this today because I think it’s such a powerful concept to understand. So what exactly is harm when it comes to your emotional immune system? Harm in this sense isn’t physical sickness. It’s emotional distress. But listen, emotional distress is not the same thing as a negative emotion. This piece is really key. Emotional distress is the inability to tolerate how you feel. We have the full spectrum of human emotions granted to us. We are supposed to feel the good and the bad, the positive and the negative. But most people do not willingly experience the full spectrum. We want all the good and none of the bad. But harm is created by having a fragile emotional immune system when you find yourself in emotional distress because you are lacking the resources and skills that you need to cope with how you feel on your own, to cope with any and every emotion on your own. That is why people turn to numbing. That is why people turn to food and to drink to try to cover up, to try to numb how they are feeling. Your emotional immune system is how you regulate the flow of emotions. And so the question is are you equipped to handle all of your emotions? Not just the good but the shame and the anxiety and the fear. What happens then? Do you freak out? Do you hide? Do you try to cover up? Do you numb? Or do you feel equipped to handle all of these emotions on your own, or does it send you into distress? Because here’s the thing; until you start learning the think-feel-act cycle, until you learn that your thoughts create your feelings and your feelings drive your actions, guess what you will be doing. You will be in emotional distress when you have the normal flow of negative emotions, but you will also be creating more of the same because your thoughts will be creating more negative emotion for you. Now here’s the thing; with both immune systems, with both your physical immune system and your emotional immune system, it is easy to inadvertently weaken them. You can do this without even knowing that you are. So remember, in order to thrive in the world, you have to learn to fend for yourself. So your immune systems are always learning. What happens when I eat this, what happens when I touch that? Exposure is how the immune system learns because exposure is how your immune system encounters pathogens. Your immune system is trying to develop to its full capacity and it can’t just do that hypothetically. It can’t just imagine bacteria and viruses and fungi and all sorts of pathogens and what it will do. It needs actual practice. Encountering pathogens in the real world teaches the physical immune system how to respond, how to protect you. So when your body encounters various threats, your defenses learn how to respond and then you are much more able to deal with that threat in the future. Your body has a memory all of a sudden. Oh, I remember that bacteria, I remember that virus. In that way, our body is adapting to the environment. And your immune system, it really has a job and its job is to identify the challenges to the body that are lurking in the immediate environment so that you can better survive. And think about this; for thousands of years, the human immune system, our physical immune system was under constant assault. But now, in our modern world, everything’s kind of too clean and too protected and it’s almost like we can live in a bubble. And not having regular interactions with a variety of pathogens can actually be very disruptive to your physical immune system. Being overprotected, which seems to logical, that’s what I was thinking when my baby – I just want him always to be healthy. I don’t want him to be sick. It seems so logical. It actually puts the body at more risk. I was doing some research on this and I found this beautiful example of hay fever. Hay fever is basically seasonal allergies. So you have too much pollen, other airborne irritants and it leads to a runny nose and itchy eyes and sneezing. You know what hay fever looks like. But when I was doing research, I found that back in the 1870s, doctors started to notice that only certain populations seemed afflicted by hay fever. And they noticed that the wealthier you were, the more likely you were to have hay fever. Hay fever, they called it a disease of the aristocracy because it was people who spent more time indoors, less time outside, less time in the fields, less time around pathogens who were suffering more. Their immune system wasn’t getting properly trained. Without the exposure, it wasn’t learning what to do in the face of pathogens. And so what happens? The immune system starts to overreact. Instead of handling the ebb and flow of pollen and the natural world, it would start to overreact in the presence of pollen, which would lead to inflammation, which would lead to hay fever. Not being regularly exposed was actually making the immune system more fragile when it encountered pollen. It’s such a great example. Our immune system requires exposure to certain kinds of germs and potential allergens, and a lot of this exposure happens in childhood. That is when the immune system is learned to develop to its full capacity. So keeping children away from dirt and potential allergens actually deprives an immature immune system, an immune system that is developing, it deprives that immune system of a learning experience needed so that it can develop to its maximum protective capacity. A lack of exposure makes the body’s immune system fragile so that you are less able to thrive in the world, and this happens with your emotional immune system too. So kids can become overprotected not just from germs and pathogens, but from exploring and from failing and from social exclusion. Keeping kids safe from their negative emotions actually deprives their emotional immune system the opportunity to develop the skills that it needs so that the child can become emotionally resilient. And down the line, without this exposure, you’ll end up suffering more. When you’re exposed to ordinary life events or unpleasant social situations, you’ll suffer more because you weren’t developing your emotional immune system. I was thinking about this concept and it made a lot of sense but then I thought well wait, I’m not sure that I was necessarily overprotected because I felt so much negative emotion, especially when I was a kid. But remember, the emotional immune system is how your mind manages the flow of feelings, how you mind manages the positive and the negative emotions so that you can thrive and avoid harm. And harm does not equal negative emotions. Harm is that emotional distress that you experience when you are unable to tolerate how you feel and this I had huge problems with as a kid. Negative emotions for me, they weren’t supposed to happen. They were a big problem. They needed to be immediately solved, immediately fixed. And if you have heard me talk on the podcast before, you have heard me talk about how I started learning how to cover up how I felt way before I started drinking. Before I was overdrinking, I was overeating. I learned to use food as a way to deal with how I felt. So if I felt awkward or anxious or insecure, I would just eat my feelings. And then when I went off to college, I learned that I could more quickly cover up these emotions by drinking my feelings. Overdrinking was the result of the fact that I had a fragile emotional immune system. I was exposed to a lot of negative emotions but I was also exposed to the idea that negative emotions were a problem. They were an emergency that needed to be fixed right away, and that belief made me more unsafe. When we get into the habit of drinking, we are unconsciously teaching our brain that it can cope with a negative emotion by pouring a drink. You pour a drink, you’re able to change how you feel, and that habit of drinking weakens your emotional immune system. It weakens your ability to manage the normal flow of positive and negative emotions. You’ll hear people say this all the time. “Oh, I just need to take the edge off of how I feel. Just need a drink.” Without that drink, feel a little stressed or a little anxious or a little bored or lonely or deprived. You’re essentially teaching your brain to use a drink to manage the flow of positive and negative emotions. And then when you don’t have that solution, when you don’t pour a drink, guess what happens. You’re in emotional distress because you have weakened your body’s own ability to manage and tolerate how you feel. And this is why changing the habit is so powerful because it’s not just about learning how to manage your urges, it’s not just about learning how to reduce your desire. It’s about learning how to build a strong emotional immune system. An immune system that has maximum protective capacity, and that doesn’t mean you don’t feel negative emotions. What it means is that you have newfound resilience when you feel those negative emotions. You know how to manage them on your own. You have to start thinking about this habit as not just something that you have to deal with the next day when you have the hangover or not just something that’s adding a lot of extra empty calories. It is a habit that is depriving you of a strong and resilient emotional immune system. And without that strong and resilient emotional immune system, it hugely impacts how you interact with the world, how you thrive in the world. That’s why this work is so powerful. So the question then becomes how do you build a strong emotional immune system? There are a couple things you can do. One, you have to be willing to feel your feelings. It sounds kind of soft. Feel your feelings. But it is the building block to a resilient and strong and protective emotional immune system. Because what are doing instead of feeling our feelings, we’re running to cover them up with a drink. You have to do that work. Feeling your feelings is not a soft thing. It is a building block for a strong emotional immune system. Feeling your feelings allows you to become more conscious of your emotions, and when you are more conscious of your emotions, you can start asking yourself questions, well, how do they feel in my body? And not only that, why am I feeling them in the first place? This is how you start to learn the think-feel-act cycle. Not covering up how you feel with a drink or with food or any numbing activity, any activity of just consuming something more and more so that you can distract from how you feel, that is what allows you when you stop doing that, that is what allows you to start seeing how the think-feel-act cycle is actually unfolding. And until you can see it and until you can witness it, you will be unable to change it. In order to build a strong, resilient emotional immune system, you have to be willing to take action over and over again. You have to start to do the work of learning how to persevere. I talk about this all the time. Taking action really is just a willingness to learn. You have to be on a mission of constant learning, constant exploration, constant discovery. That’s what we’re doing. Unraveling the habit isn’t just a matter of crossing days off a calendar or saying no, and in fact, when you limit yourself to just say no or crossing days off a calendar, you miss the learning component. Yes, you’re taking action to say no, but you’re not understanding why it was your brain wanted to say yes in the first place. In order to build a resilient emotional immune system, you have to trust that you control your life rather than life controls you. This is huge. So many of us out there feel as if – I felt like this for the longest time, that I was at the mercy of my life. That life was happening to me and it was not happening to me in a good way. This is the difference between having inner control versus external control. When you have inner control, you understand that life is not happening to you. You are happening to life. When it’s external control, then you are constantly trying to get all the circumstances in your life in order, trying to get everything to line up so that you can feel good. And this really is at the heart of the think-feel-act cycle, it is the understanding that everything out there in the world, everything happening, every person, every event, yourself, it’s all neutral until you think a thought about it. That’s how you start to develop this inner control versus external control. And it really is about your perspective. Your thoughts are simply the lens through which you experience the world. And I always tell my clients, the greater your ability to see multiple perspectives, multiple interpretations of events, of other people’s behavior, of you and your own capabilities, the ability to see many different perspectives is the building block of this work. It’s hugely important because it means that you don’t have to be stuck in your brain’s initial kneejerk interpretation, which I guarantee is probably negative. You can start to choose what you want to think on purpose. Think about your emotional immune system the next time you are challenging yourself not to drink, the next time you’re challenging yourself not to come home from work feeling all the stress and anxiety and immediately going to open a bottle of wine or the next time you’re headed out to a restaurant and you know other people will be drinking and you’re choosing not to. The next time you go to a party, whatever it is. Think about this as practice for your emotional immune system because it is not just a physical immune system that you need to care about. It is not just a physical immune system that helps you thrive in the world. It is also your emotional immune system. It is also your ability to manage the flow of positive and negative emotions without falling into emotional distress, without falling into this inability to tolerate how you feel. Having a fragile emotional immune system is the result of the habit of drinking. The more you drink, the more fragile that emotional immune system will become. The more you will weaken it. This is the work of creating resilience for yourself. Resilience through your emotional immune system. So powerful, and such a good way to think about why it is that we get sick, why it is that we encounter negative emotions. It’s so that we can thrive in this world. Alright everybody, that’s it for today. I will see you next week. This episode spoke to me as many do. Emotional fragility, inability to deal with. Food is my coping mechanism. I don’t feel in my body. I am all head. All numbing. I truly don’t know how to feel an emotion. I do, of course. I laugh. I cry. I grieve. But all in my head. I’m 63, almost :). How do I get into my body, how do I hear it? Thank you. Great question Isabel. Listen in to future podcast episodes for this question to be addressed.